With each passing year, the world continues to be amazed by the many and newer technological innovations such as linear actuators. Integration of linear actuators from http://progressiveactuators.com in applications such as home automation has increased efficiency and given users control over their household appliances. Development of apps that run on either Android OS-powered device has made it even easier because users are currently controlling their appliances remotely. It is indeed revolutionary, and the expectation is that newer and more complicated applications will be developed. Home automation systems continue to evolve, and currently, they are using the most complex communication technologies. While linear actuators have in a way helped the automation process, the need for human effort cannot be eradicated. With the different levels of control, the control capability has indeed become a completely sophisticated module. Below is a detailed elucidation of the home automation system. Home automation can simply be described as the process of controlling one’s appliances, for example, audio and video, lighting, heating, and conditioning as well as those in the kitchen. Controlling can either be done through manual or automatic means, and this depends on the user’s preference. Sensors come in handy here because they help to detect the differing conditions and states and thus effect change accordingly. Aside from controlling, home automation systems are advantageous in that they can also help to save energy and also enhance security within a user’s household. Sensors are unique to the home appliances which are then connected to the appropriate actuators. For the desired change to take effect, the actuators are often connected to input and output modules which change when the necessary conditions (a certain temperature, motion, darkness or light, smoke, etc.) are detected. Once a change is detected, the central control system then triggers the change through the actuators which take the form of relays, motors, or switches. There are several varieties of control systems or controllers, and they include high-end modular programmable logic control systems or the compact control systems. To help users navigate or get acquainted with the automation, there is a user interface through which users can interact with the system through their tablets or smartphones. Vast amounts of applications have been developed for Android,and the fact that it runs on different devices makes it an ideal platform that can help users control their appliances remotely. To control one’s appliances remotely using an Android-powered device, one needs an appropriate Graphical User Interface which should then be connected wirelessly to the appliances.Typically, in a home automation system, sensors are connected to a central system, and also an input/output device module which communicates and actuates the signals that emanate from a smartphone or tablet depending on the gadget that the user is using. Through the diagram above, home automation through Bluetooth communication is explained. The above home-appliance control diagram is an example of a system that uses the 8051 microcontrollers. The major elements of the above include a microcontroller, power supply, Bluetooth, and a relay driver and loads. The power supply essentially provides power to the circuit. It works by stepping down, filtering, rectifying as well as regulating the AC power to a more delimited DC power which is indeed sufficient for both the microcontroller and other devices that aid in controlling. The Bluetooth modem is mainly for wireless communication purposes and works by providing two-way communication. It also supports SPI and USB protocols. The microcontroller can be described as the system’s brain because it controls all operations of the system. It receives signals via Bluetooth and is developed using the C programming language. The lamps on the diagram above have been used as examples but do not necessarily mean that one cannot add other loads. 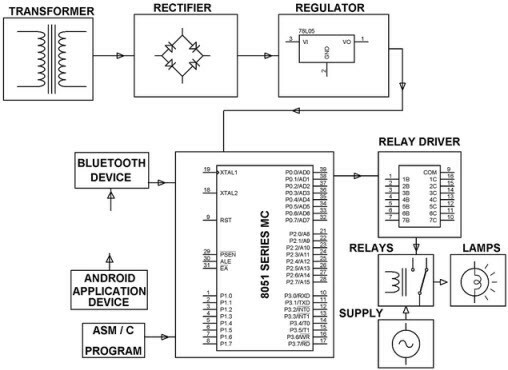 The relay driver shown on the diagram helps to energize the relay coils,but this is solely dependent on the signals that are received from the microcontroller. To operate the circuit, one first needsto pair their device to the microcontroller via Bluetooth. After the pairing, one can then test the responsiveness of their appliance by sending some signals from their device. By pressing a button or tapping on their device’s screen, users can initiate certain changes, and if paired, the modem receives the signals and acts on them in accordance with the code processed. Once the processing is over, the control signals are then relayed to the relay driver IC which then provides the necessary energy to force the loads to effect change. This system can be of great importance particularly for the old and physically challenged individuals. Instead of manually operating the loads, this system will provide them with an easier and automated way of controlling the loads. The microcontroller can also be fitted with a temperature sensor load and through this one will be able to control temperature variations in their surroundings. In this article, readers were only being provided with insight on how best to incorporate the concept of home automation.